As cute as cats are, things can definitely get a little messy sometimes if you’re a cat owner. Mind you, we’re not talking about the cats themselves, per se. Any feline parent knows just how meticulous their pets can be about grooming. Nope, what we’re talking about here is messiness in and around the litter box. And depending on the kind of litter box you have, the type of litter you use, and even how many furballs you have using it, things can get a bit untidy—even around the rest of the house. Enter a cat litter mat. Have a mat or rug under your kitty’s litter box isn’t just a good call for aesthetic reasons—it can really help cut down on household mess. To help you find the best cat litter rug or mat for your home, we’re going to review some of the top picks out there. But first, let’s look into the specifics as to why you probably want to get a mat in the first place, if you don’t have one in place yet. Why Do You Need a Cat Litter Mat? Most cats have no problem learning how to use a litter box. Honestly, the most challenging thing about it is usually keeping the litter box and surrounding area clean! This is the number one reason why a cat litter mat is so helpful. The right kind of anti-skid, durable, and textured mat underneath your animal’s litter box will dramatically cut down on the amount of litter that gets tracked around your home (and into the air) by unsuspecting kitty feet. A good quality mat provides a surface for loose litter granules to fall into and get trapped. This means there’ll be less litter scattered around your home, and more of it concentrated around the box itself. And yes, no matter how good your kitty litter or litter box are designed, there’s bound to be some spillage. It’s just the nature of the game, sadly. So, you may as well prepare for this reality by putting down a comfortable, durable, and effective surface to help trap loose litter. You’ll save a lot of time and spare yourself a lot of headaches this way! Additionally, because it gently cleans your animal’s paws, a litter mat may even be helpful for you kitty’s health, too. Having a place to wipe off her paws after she’s done relieving herself can reduce the chance of your four-legged friend ingesting litter, which could cause gastrointestinal upset. This is especially important for young kittens who instinctively love to put things in their mouths! What does a good mat look like? Let’s dig into that now. Clearly, anything that’s going to be placed underneath a litter box needs to be able to withstand frequent use and mess. A mat made with durable material will last longer and be less likely to get horrendenously stained or foul-smelling (of course, regular cleaning of your mat will help prolong the mat’s life and durability—and we’ll talk about how you do this in a later section). There’s no point in having a cute little mat under your animal’s litter box if it doesn’t actually cut down on the tracking! A good mat or rug effectively traps litter granules (rather than letting them sit and potentially skip off the top) and stops the majority of them from getting brought out into the rest of your home. Litter boxes aren’t exactly the nicest-smelling part of your house. You want to make sure the mat you choose won’t start smelling up the place even more by giving off any unpleasant odors, whether from the material itself or from the litter debris that falls on top of it. A good quality rug will be water resistant so you won’t have to worry about moisture seeping through the mat onto the floor. Water resistance is also an important feature of a mat’s durability, since it needs to be able to stand up to routine washing and cleaning. Mats do need to be cleaned in order for them to work well and cut down on the smells and debris. 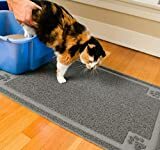 Fortunately, most of the best cat litter mats are super easy to clean with something such as once over with a vacuum or a simple shake down outside. A good one should be gentle and easy on cats’ and kittens’ paws. For instance, you don’t want a mat made of super hard rubber that’s prickly and uncomfortable to the touch. Remember: you want to encourage your cats to use their litter box—if you put something under it that’s irritating, you could be stirring up a recipe for a housebreaking disaster! Safety considerations regarding your litter rug include: fibers which won’t snag on your cat’s claws, a rug that won’t slip or skid around, and material that is non-toxic. Too small, and your mat won’t be able to catch litter from all sides of the box. 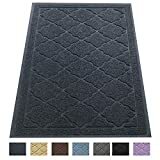 Too large, and the mat may look like an eyesore or get caught on door jams or other surfaces (depending on where the litter box is in your home). In general, a cat litter mat should extend at least a few inches out from each side of the box, but the ideal dimensions for your situation will be largely a personal choice. The best litter mat above all for your house is going to be one that works and that you don’t mind looking at every day. This large litter mat from Easology pledges to trap up to 37% more litter granules compared to other options out there. Pet owners who’ve put it to the test seem to agree, although a few note that it’s just a bit too large for small spaces. It features a unique, soft, and pliable looping texture with low pile for a reduced risk of claw snags. Plus, it has a non-skid bottom surface that’s floor-friendly, and is non-toxic so it’s safe for even the littlest paws. The mat features a subtle pleasant design and comes in seven color options. 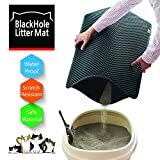 This jumbo mat features a double layer of material with extra big holes on the top layer to allow litter to fall right through where the granules stay contained on the hidden bottom layer. The manufacturers even claim that you can simply dump back any unused granules from inside the mat right back into the box, potentially saving you on litter costs. At a jumbo size and 5 pounds, this patent-pending material can really hold a lot of loose granules and will fit 2-box set ups well. Unfortunately, a few owners have noted that they can’t easily use a vacuum on it and the material isn’t quite as durable as they’d like. This mat is slip resistant, comfortable, non-toxic, and large enough to catch stray litter on all sides of a box. Cats seem to like it, and at least a few users note that it even holds up well to urine accidents, too. 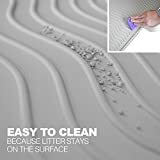 If anything, the mat may work almost too well, as some users have found that not all the litter comes out easily when shaken or vacuumed out. 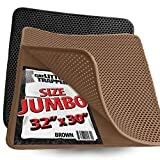 This cat litter mat is a bit on the pricey side but it works well with a variety of litter boxes and does an effective job at trapping litter. It’s easy to clean with a double layer feature, with the top layer made with large holes to contain various sized granules. Some users have found that it’s easier to just bend the mat into a C-shape and dump it out that way rather than separating the layers—otherwise, some litter granules tend to fall out. You may like this mat because it features large deep holes on the top layer for effective litter trapping. The bottom layer is waterproof so can protect your floors for urine pretty well, too. It also has a comfortable honeycomb design to get litter off your pets’ paws gently and effectively. Large and deep holes trap litter from box and cat paws, saving your unnecessary cleaning time. This litter mat is one of the more unique options in our review. It’s made with non-toxic and high quality silicone and generally seems to work effectively. It’s also extremely easy to clean, although some users don’t like that it’s heavier and pricier than a lot of the competing brands. This litter mat comes with a lifetime warranty, and fortunately it seems durable enough to really hold up against kitty traffic. It has a non-slip feature so it won’t move around, and is non-toxic (phthalate and BPA free). A few users find it’s not quite as durable as other brands, but overall the reviews are glowing and the mat appears to really cut down on mess. Get fancy with this kitty litter mat—you can select from one of seven colors to really fit your home decor! It’s phalatate-free so safe and gentle on kitty paws, and has a solid floor-facing backing to prevent movement and spilling. It also features deep grooves and high quality mesh to catch loose litter effectively. The last litter mat in our review comes in a few different size and color options. 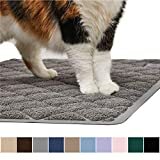 The patented design allegedly helps gently spread out a kitty’s paws to help loosen up any granules so litter can be effectively trapped on the mat. It also appears to withstand moisture well, making it useful for households with very young or very old cats who may be prone to accidents around the box. Medium size measures 23.25" x 14.9"
If you’re anything like most cat owners, reducing the amount of litter that gets tracked around your home is a top priority for you. As we’ve seen, using a cat litter mat can be of great use to this end by providing a place for loose granules to become trapped. Experiment with different type of litter. Look for a dust-free formula and consider using a self-clumping and/or larger granule size brand. Just realize the type of litter you can use will be influenced by your cat’s age, your cat’s temperament, and even how many cats you have in your family. Experiment with a different kind of litter box. Some pet owners find more success with high-sided, top-entry litter boxes because this reduces the amount of litter that gets kicked out during use. Consider placing your cat’s box in a spare tub, shower stall, or a “cat furniture” furnishing. Of course, this is highly dependent on your cat (e.g., older cats may not be able to climb or jump well; some cats don’t feel comfortable in contained spaces) and your home set up. Vacuum and sweep the litter box area regularly (even with a mat in place). Yes, this requires some effort on your part. But it’s well worth it if you can keep your house tidy while at the same time giving your beloved kitty companion a clean and comfortable place to do her business. One of the main points of having a cat litter mat is to reduce the amount of vacuuming and cleaning you have to do around the home. With fewer rogue granules to chase down, you’ll be able to spend less time cleaning your home and more time playing with your feline! But litter mats do need cleaning on a routine basis. How you clean the mat really depends on the type of mat you decide to get. Most come with instructions from the manufacturer, so simply take note of this at the time of purchase. In general, a kitty litter mat can be adequately cleaned off either with a vacuum or with soap and water. To make your life a little easier, try shaking off any excess litter and debris into a trash bin first before vacuuming or rinsing off. The right cat litter mat in your home can make a world of difference for you and your sweet kitties. This kind of litter box accompaniment is a relatively cheap and unobtrusive solution to your tracking concerns, and can make the bathroom experience for your companion just a little more pleasant, to boot.